The UFC is the top organization in the world of mixed martial arts. It has the most famous stars and plenty of shows for MMA fans to take advantage of. But the UFC is not the only game in town. Bellator, with is presence on Spike TV, is getting more attention from fans. 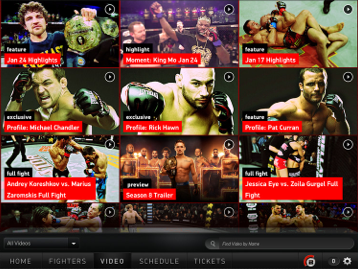 Thanks to Bellator MMA for iOS, you can keep up with the latest Bellator news on your tablet. Bellator MMA makes your experience watching Bellator shows more fun. You get to participate in the on-air broadcast. The fighter analytics tool gives you enough information so you can score fights with more confidence. 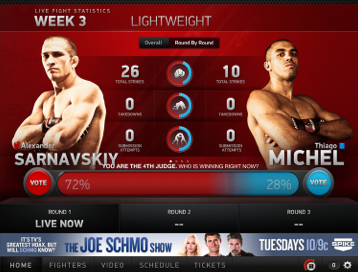 The app provides you with historical stats and fight of the night polling. Exclusive videos are made available too. Bellator MMA is not for everyone. But if you are a fan of Bellator on Spike TV and would like to participate in on-air broadcasts, this app is what you need.